I love this pillow so much I am ordering another one. I got it originally to help me decide if I wanted a latex mattress. This is the best pillow I have ever had, and I'm not young! It is soft and comfy, but supportive. I no longer have to fluff and fold my pillow all night. Natural latex foam pillows provide many benefits for those seeking an alternative to traditional pillows. Natural latex foam pillows have excellent ventilation to keep you cool and dry throughout the night. Natural latex pillows offer resilient, responsive support, and have the added benefit of being naturally hypoallergenic and anti-microbial. Experience a new standard of sleeping with a latex foam pillow that comes with a 5-year warranty! Natural latex foam pillows gently conform to your every move, providing ideal support to your head, neck, back and spine. Talalay natural latex foam pillows are hypoallergenic, anti-microbial, mildew-proof and dust mite-resistant. 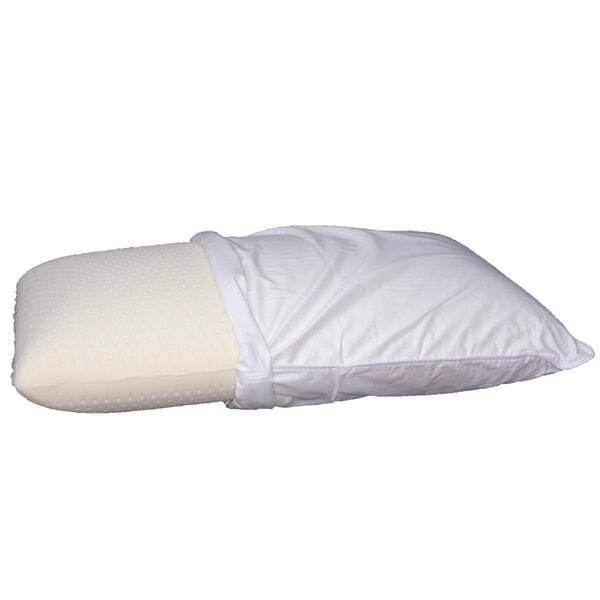 Each pillow includes a 100% cotton removable cover. Wake up feeling fresh, cool and dry after a healthy night's sleep! Fill: solid 100% natural latex foam. Dimensions 20.0 In. X 26.0 In. X 6.0 In. I thought that this pillow was comfortable at first, but got firmer and gave me neck pain after 4 months of use. Also, has an unpleasant odor. Would not recommend. "Is the standard size going to be available to purchase soon? Is standard only 3.5 inches thick?" "How thick is the latex pillow"